4th of July Outfits for Kids. 4th of July festivities are about to start. Everyone is ready to leave a style statement but what about the kids? Still haven’t sorted out how to dress your little bundle of joy up for the independence day? 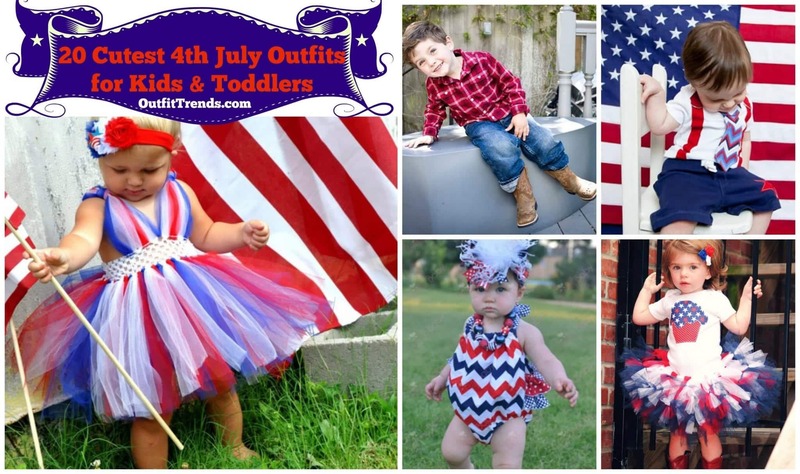 Worry not, here we have some super duper cute 4th of July outfits for kids. As important as it is to dress them patriotically it is equally important to make them wear an outfit that they can play around and be comfortable in. Dress up your little princess in a blue, red and white tutu outfit and pair that up with a white, red and blue floral head band. You can also add up a pair of simple booties, whatever your daughter feels comfortable in. If I were to dress up my little girl in this though, I would definitely go for those cute barefoot shoes or sandals that you can easily find in the colours of American flag. Check out this beautiful pair for example. For your little prince, a grey flag printed shirt with comfy shorts will look so dapper. Add on a comfy pair of white sneakers so he is able to enjoy the festivities to the fullest. This look is perfect for those adorable little fashionistas who love dressing up. Stripped pants with a black tank accessorized with a silver chain necklace and silver sandals. SO CUTE! For your little dude, a red check button down shirt with blue denim jeans will look perfect for the 4th of july if paired with brown boots. Make your leeeedul muffin dress up in a red coat with a knitted undershirt and partner that up with red legging and red booties. A super lightweight denim button down will look perfect with red shorts and brown shoes. THAT LITTLE DUDE THOUGH. A grey t-Shirt with red and white stripped legging pants paired up with blue sneakers. Make your little hip girl stand out by adding a beanie to her outfit. This independence day make your little one look like a TOTAL HOTTIE in a black and white check shirt with red pants and a polka dotted Velcro bow-tie ANDDDDD brown Oxfords. Trust me this one is gonna get your child noticed. 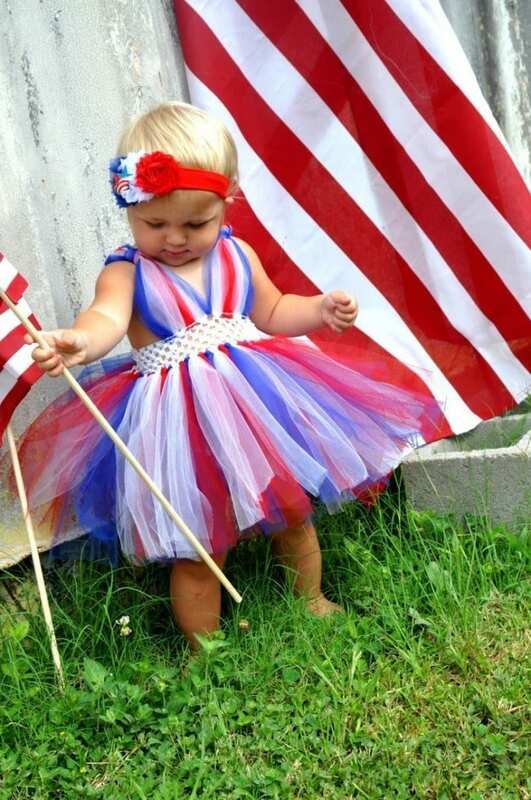 Make your little look the most adorable American toddler this 4th of July. Make her wear a red, white & blue chevron bubble romper halter outfit and add a matching bow head piece. SO CUTE I COULD LITERALLY EAT THE CHILD UP. OK WELL NOT REALLY. Make your soon look like the coolest kid in town with this outfit. Star and stripped pants with a black graphic tee and check cap. For the footwear a pair of sneakers will look good. Add a chain necklace for that rockstar look or its perfect otherwise. If there will be a lot of family activities this holiday, this outfit is perfect for your child. Comfortable and patriotic. A white dress with blue and red stars on it. Add up a pair of simple red boots. Alsoooo, if you make two top knots with a middle partition and a braid on one side. It’ll look ADORABLE! This independence day, go for a stripe-y outfit for your little stud. A white shirt with red stripes and white shorts with blue stripes will look perfect if paired up with a white bow tie with red and blue polka dots. Make your doll dress up in red glittery sequin shorts with a bow at the waist and a white tank tee. A shiny bow headpiece and red or white sandals will compliment the look perfectly. A white shirt with denim cut-out shorts and with a cute little red bow tie. Add that bit of patriotism with American flag converse. Some swaggy shades too maybe? HOW HOT! An American flag tank romper is perfect for little miss America. Partner it up with a blue bow headpiece and a pair of red sneakers. All little Mr. America needs this 4th of July is a white tee with red suspender gallace and blue shorts with a red star on it. Add a Velcro tie with blue, red and white stripes on it and Mr. America is good to go. A sleevelss blue and white stripped flair-y dress with a glittery star will look super patriotic. Finish off with a pair of sandals. A white Tee with blue and white cupcake on it that has stars on it with a color coordinated tutu. Finish little princess’ look off with red long boots and some red, white and blue clips. SOOO PERFECT.